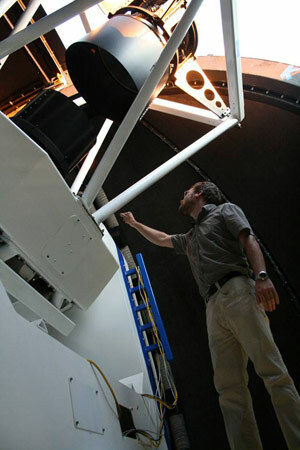 Dr. Stefan Keller with the SkyMapper telescope. Using the ANU SkyMapper telescope at the Siding Spring Observatory, astronomers have discovered the oldest known star in the Universe. 1 Comment on "Astronomers Discover the Oldest Known Star in the Universe"
Along with this ancient cosmic evolution, which is the probability that within a galaxy like the milky way, from the dust of its exploded stars, the living being who uses a computer was formed – computer included? A favourable case among infinite unfavourable possibilities? Fifty-fifty? To be or not to be, is that the question? Or is it a zero followed by a radix point and an infinite amount of zeros behind, but finishing with a one emerging from error or compassion when rounding up? Are calculations simplified or made more complex when the subjective self of each one is the entity that is studied? Anyway , what is the relationship between life and immense numbers? Is life a folding process of infinity? Is it just something infinite that would have enough to allow a self, something isolated but of infinite claims? But, is infinity credible within something with a beginning, out of a Big Bang? And is it credible within something with an ending, with the inevitable death around the corner? Just another mind leisure suggestion, far away from dogmas or axioms.